Social networks like Facebook, Twitter, LinkedIn, Snapchat are helping publishers while becoming the publishing platforms themselves. We take a look at the initiatives by these social networks. Earlier this year GlobalWebIndex polled 170,000 internet users about their internet habits, and found that average usage times for social media sites rose from 1.66 hours per day in 2013 to 1.72 hours per day last year, which represents about 28 percent of all online activity. With the year coming to an end and smartphones on the rise, the percentage must have increased. But the core point is that we spend a lot of time on social networking sites from consuming information to entertainment. Some 41% of people around the world get their news from Facebook each week, a number that towers over Twitter (at 11%) despite the media’s obsession with the Twitterverse. Reuters Digital News Report 2015 also highlighted the fact that WhatsApp, a mobile messaging platform bought by Facebook in 2014, is a popular source of news consumption in Spain and Brazil. And search isn’t going away. It remains strong in Italy, Spain, and Germany, countries where more than 50 percent of users say their news discovery starts with search engines. Social networks are no more your distribution platforms but they are the new age publishers. The trend that picked up in 2015 is going to intensify in the coming years. From Facebook to Snapchat, everyone wants users to not only consume content on their platform but also publish content and stay in their walled garden (to be read as a Facebook approach). Facebook pressed the button to be the publisher first. Earlier this year, Facebook launched Instant Articles, a new product for publishers to create fast, interactive articles on Facebook. Instant Articles debuted with rich-media stories from The New York Times, BuzzFeed, National Geographic, and six other outlets that will be globally visible from Facebook’s iPhone app. During the time of launch Facebook promised that Instant Articles will not feature a stripped down textual dump but come with additional features stuffed by Facebook. From having a logo on the top of every story, publishers had a “follow” button that users can click to subscribe to their Facebook page and get more stories. The body of the story can contain photos, image galleries, and videos, and publishers can use a web view to embed objects like tweets and interactive graphics. Beyond just loading faster, Facebook will parse HTML and RSS to display articles with fonts, layouts, and formats that make Instant Articles feel like a publisher’s website. Facebook is also providing vivid media options like embedding zoomable photos, videos, and maps with audio captions, plus contextual ‘Ambient Videos’. All this added with preferential treatment to publishers when users click, like, comment, and share Instant Articles more often than others, they may show up higher and more frequently in feed like any piece of popular content. Publishers can also sell ads in their articles and keep the revenue, or they can choose to use Facebook’s Audience Network to monetize unsold inventory. After few moths Facebook informed that it is giving access to 21 new publishers and will start displaying Instant Articles to more of its users. Washington Post was one of the celebrity publishers that decided to post every single article on the platform. That would mean about 1200 stories a day on Instant Articles. Now Facebook has announced the availability of Instant Articles for Android users in India. The network has roped in India Today, The Quint, Aaj Tak, Hindustan Times and The Indian Express. From early next year Facebook hopes to open the platform for other publishers. Instant Articles content will appear within the news feed itself, and needs no app update. Today Facebook is visited by more than a billion users, so why would any publisher say no to such a lucrative deal? To further lure publishers, Facebook tweaked the News Feed. Facebook added time spent, after its research showed that people don’t always like or comment on stories that they find meaningful. But Facebook’s Instant Articles isn’t performing the way publishers would have expected. Publishers including The Washington Post, New York Times and LittleThings.com are finding it difficult to extract as much revenue per article from Instant Articles as they do from pages on their own websites, according to The Wall Street Journal. However with all these problems publishers still have faith on Facebook and the network is also working with publishers to sort issues. Facebook is also revamping the more or less dead Notes and shaping it up as a clone of Medium. So going forward you want to blog and get a bigger reach then Notes would be the answer. LinkedIn has done the same with Pulse for its professional users on its network. There are a more than 7 billion people in the world, and more than 1 billion of them checking Facebook every day. Why any leading publisher would like to say no when ad blocking is taking away their revenues. 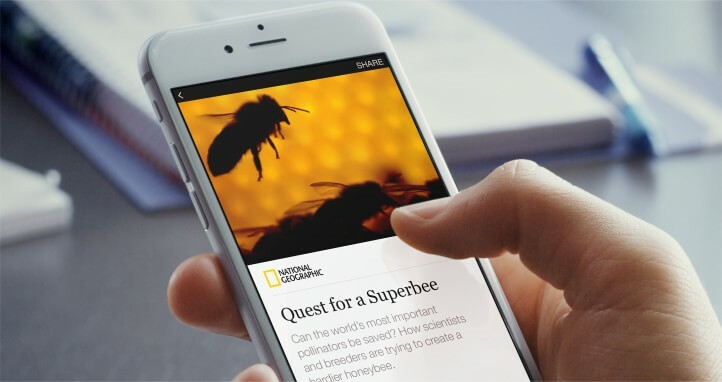 Recently, Facebook launched a real time standalone iOS news app named Notify. The app gives a selected group of publishers access to people’s lock screens. Notify pushes alerts to people’s mobile phones, serving headlines throughout the day. Users customize their selections by subscribing to media sources or “stations” of specific content from those sources. The content is served independently of Facebook; when people swipe or tap through, they are taken to the link in the app’s mobile browser. With news, the app has entertainment, food, live score updates from your favorite sports teams and weather reports based on your current location. The app that is available in US has more than 70 media organizations, including BuzzFeed, the New York Times, Entertainment Tonight and People magazine, are on board to experiment with the app. Publishers can serve notifications manually through a Facebook-built portal or automatically by tying into an API. LinkedIn, the popular professional network with 400 million members, has been focusing on content models for future revenue sources; it already has a million plus members publishing on LinkedIn. This is good news for professionals to reach out to like-minded folks and also follow influencers like Richard Branson, Bill Gates, Barack Obama, Narendra Modi, among others on the platform. The initiative kickstarted back in 2012, when LinkedIn invited established entrepreneurs and public figures to pen articles through its Influencers program. In 2014, LinkedIn opened up its publishing platform to all its members. The move meant not just influencers but anyone could drive views on the platform by sharing thoughts as blog posts. Over time these efforts have started growing and Linkedin has hence decided to cut down referral traffic. Last reported news on LinkedIn’s publishing initiatives has been its international expansion. LinkedIn already drives a global user strength, nearly 70 percent of LinkedIn members are from outside the United States, including 10 million in China. Following this LinkedIn expanded its publishing platform beyond English speaking countries, it recently launched a version for Portuguese speakers. German and French markets will be added in the coming months, with more tongues thereafter. Simultaneously LinkedIn has also revamped Pulse which the network had bought in 2013, LinkedIn ended up paying $90 million for Pulse, 90 percent of which was stock and 10 percent cash. Initially Pulse was a news aggregator with a tie up of more than 750 publications, as well as social networks. Earlier this year the app went through aa rebranding and was known as LinkedIn Pulse with a core focus on LinkedIn’s publishing ecosystem — the app analyzes what’s being written and splits the content into “channels,” which users are asked to “follow.” Later on LinkedIn redesigned and relaunched its Pulse news app for iOS and Android — and the focus was very much on personalization. The app redesign meant that users once log in, they are served with news based on their industry, connections, and any other signals, such as what they choose to follow on the social network. All these efforts have been going on for past two years to make Linkedin – the world’s first personalized business news digest. Search giant Google which was missing in action, finally made its entry with Accelerated Mobile Page Project. Nicknamed as AMP, an open source initiative that aims to dramatically improve the performance of the mobile web was launched in last month. Google claimed its tools cut down load time between 15 percent and 85 percent in initial tests. Google has stated the project to help publishers to get better engagement on a variety of platforms, including Google search and Twitter, as well as direct readers to publishers’ own sites. The project relies on AMP HTML, a new open framework built entirely out of existing web technologies, which allows websites to build light-weight webpages. Most publishers will likely publish both regular and AMP pages, something that their CMS systems likely will make easy. To begin with Google has partnered with technological companies and publishers. Twitter, Pinterest, WordPress.com, Chartbeat, Parse.ly, Adobe Analytics and LinkedIn are among the first group of technology partners planning to integrate AMP HTML pages. Apparently Facebook and Apple will stay out from Google’s open source initiative, as the duo are more interested in attacking its online ad revenues. Publishers like Vox, The Verge, BuzzFeed and the Washington Post are already live with AMP pages. AMP is scheduled to roll out more widely in the coming months. Publishers will be responsible for monetizing their own content, selling ads as they already do. Google claims it is not giving higher search rankings to publishers that use its tools, but speed will be a factor in determining where a news article appears in search results. Over the next few months, Google will be working on the project to build more features and functionality around key areas – Content, Distribution, and Advertising among others. The 140 character social network trying to solve its user growth problem in US with its new CEO finally launched its most ambitious project – Moments. Today, before a news room reports a story, it first trends on the network. Taking this further with the motive of simplifying the platform, Twitter finally launched its much awaited curated news product last month. Twitter says that Moments helps you find the best of Twitter as easily as tapping an icon – regardless of who you follow. Just visit the new tab called Moments, where you will discover stories unfolding on Twitter. Each Moment starts with an introduction and description. Start swiping to dive right into the story, with immersive full-bleed images and autoplaying videos, Vines, and GIFs. A single tap gives you a fuller view of the Tweet, which you can favorite, Retweet, and more. As new stories keep emerging throughout the day, Twitter will continue to update this list. However, the new feature assimilates the content of tweets it aggregates on mobile, but hides the vital link back to the publisher’s website without users even knowing. An original tweet with text or a photo and a link appears as just text and/or photo in Twitter’s mobile apps. The trail back to the publisher’s site where it could actually earn the money to create more of the content Twitter is aggregating, gets buried in the rich media bushes. If a user even suspected there might be more to the tweet, or wanted to get a deeper look at a story, they better get ready for some finger gymnastics, said Josh Constine in his post at TC. Twitter is desperate to simplify itself which it is determined to achieve with Moments but at the cost of putting referral traffic to the back burner. A path that every social network from Facebook to LinkedIn – who are working to be the next publisher – are blindly following. The four-year-old ephemeral mobile messaging app that has more than 200 million average monthly users has been hungry to become a publisher for the younger lot. In January, Snapchat launched Discover, a partnership between the visual mobile messaging app and publishers to distribute exclusive content. Snapchat’s publishing partners for the initial launch of Discover included CNN, Yahoo, Warner Music, People Magazine and National Geographic. However, in June Snapchat did a redesign and placed Discover – the news and entertainment section one swipe away from the main page in the “Stories” section, where Live Stories and updates from friends are located. All this comes for a premium price and brands are not budging. Read: How Snapchat Is Expanding Its Monetization Arm. From adding new publishers to Discover, the company has signaled a willingness to expand the number of sponsorships it allows on media channels and to increase the frequency of ads served to each user, said sources with knowledge of the conversations taking place. The writing is on the wall – social networks no more want to be just the distributor, they want to own the content as well as the users. All this is being done in the name of solving publisher problems while turning into publishing platforms themselves. Today severe problems like Ad-blocking, scaling issues with native content and ongoing slashing of referral traffic have left publishers with no choice but to give in to social networks. Good news is that WordPress has already announced a plugin to enable publishing in the format. The plugin will enable WordPress publishers to create AMP versions of posts with a single click. A much needed move from WordPress as not everyone is a big publisher to take advantage of Google’s AMP project. However, the trend of social networks being the ultimate publishers is going to become stronger in 2016 and the coming years. “They are smart, I’d do the same if I was one of them and as a colleague of mine in Whatsapp said recently, it’s delirious to think that we (the publishers) are in control here,” Anant Goenka, Head, New Media, Indian Express said recently to LI.